Reineke Fuchs (Reynard the Fox ) (ca. 1850), Hermann Ploucquet. Taxidermy and mixed media. Private collection. Photo courtesy of Pat Morris. PsyArt Journal, Volume 21, pp. 38–68. Abstract: An analysis of anthropomorphic taxidermy of the Victorian era, based upon the pervasive psychosocial tension characteristic of the age. Whimsical, anthropomorphic taxidermy of the Victorian era has been dismissed as marginal novelty. Yet why do we feel it also to be, in some undefined way, emblematic of Victorian visual culture? Anthropomorphic works—such as studious rabbits intent at their desks in a rural village schoolroom, athletic toads playing a frenetic game of stick-and-hoop, or elegantly attired kittens attending a wedding— represent a conflation of human and animal, of death and life, which simultaneously evokes fascination and repulsion. A closer look compels questions about the internal processes driving its creators and attracting its audience: why did such grotesque anthropomorphic expression flourish at this precise point in history? Its encoded meanings reveal, on scrutiny, rich strata of information about the meaning of anthropomorphism within the Victorian psyche, suggestive of wider anxieties surrounding the tension between theology and traditional cosmological perspectives, and the shifting association between humans and animals in Victorian England. Throughout the Victorian era, the practice of taxidermy flourished as never before or since. The 1891 London census listed 369 taxidermists (including 122 women), and rural villages and towns similarly listed multiple members of the trade. For professionals (“naturalists”) and amateurs (“stuffers”) alike, taxidermy was a facet of the popular mania for collecting natural objects and animal specimens; the demand for decorative mounts for home display alone was enormous in Britain. Grotesque an art though it is, the ostensible purposes of taxidermy—the preservation and mounting of the skins of dead animals, fashioned and posed to appear lifelike—were either scientific, to support the taxonomy of animal species; or simply to signify a love of nature. The specialty of anthropomorphically styled taxidermy—such as rabbits modeled to resemble human children doing sums with slates, or kittens posed as members of a wedding party—more pointedly amplifies the grotesquerie, provocatively fusing not only life with death, but also human with nonhuman animal. In unspecified ways, nineteenth-century anthropomorphic taxidermy is perceived to be eccentric as well as iconic of Victorian visual culture; why do we look at this work and immediately perceive it as both? What is the source of its visual power? Taxidermied animals share Gothicism’s morbid obsessions: they serve as specters of a dissociated past and as evidence of fractured relationships with nature, spirituality, and labor. Similarly, the ghostly medievalism of Gothic Revival, stirring up phantoms of the pre-Reformation Catholic past, sets the visual tone and defines the “Victorian” look of the civic urban landscape of nineteenth¬-century England. Kenneth Clark (1928), in his landmark study on the Gothic Revival, refers metaphorically to the Houses of Parliament as “a great necropolis of style” (119), the “reviving of a dead style” (120), “advocacy of dead decorative forms” (219), and “the restoration of mutilated architectural remains” (155), strikingly associating the trope of morbidity with this architectural movement. Gothic Revival’s affinity to taxidermy is thus located in this shared emotional framework, a key element of Victorian visual culture. Taxidermy advanced and began to flourish in earnest beginning in the early years of the nineteenth century, when there were so many alarming and unsettling new developments in science which upset the traditional religious view of cosmology, marked by the first publication in 1802 of William Paley’s Natural Theology (subtitled Evidences of the Existence and Attributes of the Deity, Collected from the Appearances of Nature), in which Paley presents a teleological argument for the existence of a deity by citing the ordered design of the natural world as evidence. To be sure, the defensive character of Paley’s argument in support of the existence of a deity suggests the perception of a threat to that belief system, and the popularity and influence of his book, reprinted many times throughout the Victorian era, suggest a wide emotional resonance with its purport. This tension between religion and threatening developments in science, rather than a suddenly intense but benign “love of nature,” promoted conditions which provoked the anxious desire to collect and preserve the natural specimens—such as rocks, insects, animals—which were the subjects of many widely circulated, shocking scientific studies. Indeed, the traditional balance between humans and the natural world was felt to be precipitously undermined as scientific and technological progress “exposed the Victorians to a constant succession of shattering developments,” (67) per Walter Houghton (1957), generating what he terms “mass isolation and loneliness” (77). To be sure, Houghton’s landmark study, The Victorian Frame of Mind, devotes an entire chapter to “Anxiety,” to the interconnected and convulsive psychosocial themes of the era. He notes that, as publication of one iconoclastic study followed after another (e.g., Lyell’s Principles of Geology in 1830, Faraday’s Experimental Researches in Electricity in 1839, Vestiges of Creation by Chambers in 1844, Darwin’s On the Origin of Species in 1859), “nature became a battleground in which individuals and species fought for their lives and every acre of land was the scene of violence and untold suffering” (68). Pervasive anxiety regarding the collapse of the traditional cosmological belief system forced its continued defense, not necessarily by making a theological argument, but by framing the new evidence of science in such a way which attempted to make it palatable and supportive of theology. Indeed, what we know as the field of physics was still known as “natural philosophy,” and research in electricity such as that typified by Faraday’s but which had been ongoing since the late eighteenth and early nineteenth centuries, was fraught with anxiety about its connection to the “vital principle of life” (Morus 1993, 50)—Mary Shelley’s Frankenstein had spoken to that anxiety earlier in the century, and again in her 1831 revision, which as P.M. Harman (2009) points out “places emphasis on the religious values that Frankenstein’s actions may be seen to transgress” (328), as if to address the larger struggle. Frankenstein’s monster also augurs Charles Waterton’s Nondescript (see below) if only as a reflection of a shared sense of psychic fragmentation. In 1834, in response to publications such as those named above, Peter Mark Roget published Animal and Vegetable Physiology, Considered with Reference to Natural Theology, Treatise V in the series known as The Bridgewater Treatises (the full title of which is The Bridgewater Treatises On the Power, Wisdom and Goodness of God As Manifested in the Creation). His aim was to draw upon Paley’s Natural Theology and integrate it with the most current scientific data regarding plant and animal life. As Jonathan Topham (1992) frames it, Roget’s text “clearly reflected widespread fears concerning the various dangerous kinds of science which had currency in Britain during the tumultuous 1830s” (404). Topham writes that the Treatises “rank among the scientific best-sellers of the early nineteenth century” and that both their popular, non-technical approach and their well-credentialed authors provided to the newly formed middle-class—the “landed, mercantile and professional classes” (397)—a “religiously conservative compendium of contemporary science” (398). When cheaper editions were published in the 1850s, their audience grew to include both working-class readers (often via mechanics’ libraries) and educators, who could find value in scientific material which did not subvert but upheld their religious views. Further, proto-democratic political movements such as Chartism and violent rural labor revolts were concurrent with scientific change, especially between 1830 and 1850; as Houghton (1957) suggests, some of the social anxiety of the era was particular to the upper classes, who feared that the laboring classes would become uncontrollable within a democratized government, and there were alarmist connections drawn between social unrest, science, and the shedding of religious values: “A Chartist advocating democracy might be called a communist, but he was certain with more justification to be called an infidel—which made him twice as dangerous” (60). Topham (1992) emphasizes that “Natural theology was thus a means of sanctifying science for evangelical consumption. This process was of particular importance among the working classes, where secular science was associated by some evangelicals with revolution” (426). Multiple editions of the Treatises, particularly Roget’s, designed to offset the dangerous influence of science, attest to the continued currency of the concern. Proto-Darwinian theories emerged: Robert Chambers’ Vestiges of the Natural History of Creation, was published anonymously in 1844 and advanced the notion of “species transmutation,” citing simply “the powerful nature of evidence” (145) of fossils. Yet the main cause for apprehension was that such concepts did not support the perceived divine plan in the social hierarchy—the class system—therefore the ideas would be very dangerous if the working classes or Chartists found resonance in them; hence, in part, the wide fear of social catastrophe. Indeed, “catastrophism” was a popular geological theory of the era. Adelene Buckland (2007) points out that Victorian London’s display culture featured geology spectacles in the form of “the panorama, the diorama, the cyclorama” and that “sensational and spectacular displays of dinosaurs and other ‘monsters,’ and something like ‘catastrophism’ was a popular visual form in the city’s many earthquake and volcano shows” (679). “Catastrophism” might also be the term to describe the popular emotional mood of the era; to be sure, the resonance of the simulated earthquake show is telling in this respect, as it symbolized a pervasive social unease, among all classes. Furthermore, Lyell’s Principles of Geology asserted that geologic change was normal, heretically challenging a divine influence but also effectively defending against fearful theories of catastrophism; the resonance of this influential book further speaks to complex and multi-layered social anxiety. As public resonance with Paley’s work first suggested a generalized and widespread sense of conflict between theology and science, and as a cascade of subsequent publications made the entirety of the natural environment and humans’ place in it the constant subject of intense scrutiny, the obsessiveness which manifested in the craze for collection, classification, and preservation of plant and animal specimens on such a wide scale both confirmed and indicated an impulse toward resolution of that conflict, but in much the same way that an abduction represents an impulse toward connection. As Lynn L. Merrill (1989) notes in her study, The Romance of Victorian Natural History, Victorians, “famous and obscure, rich and poor, privileged and plebian” could often be observed “turning over rocks in tidepools, chipping at stones with hammers, pouncing on beetles and butterflies, or trolling dip-nets into ponds” (4), all in the interest of maniacally collecting specimens ostensibly for study and classification. Best-selling books of the era further evince the broad scope of obsession with natural objects, such as John G. Wood’s Common Objects of the Country, which sold over 100,000 copies in its first week of publication (Gates 2007, 540), and Sarah Bowdich Lee’s Taxidermy, or the Art of Collecting, Preparing and Mounting Objects of Natural History, for the Use of Museums and Travellers, whose first of many printings was in 1820. As the century progressed, and as science correspondingly encroached upon theology, Victorians attempted to reconcile the two, in part by displaying this fervent devotion for natural history as a serious pastime, a pursuit which “amounted almost to a creed,” as Merrill (1989) puts it (4). Hence, as Victorians were spurred on by the rupture of the familiar, the obsessive collecting of natural artifacts intensified, as did their display in private cabinets and eventually in natural-history museums, as if to frame the human relationship to the rest of nature. Yet obsession itself, as Patricia Meyer Spacks (2011) reminds us, “obscures rather than illuminates” (166), and a myopic, destructive preoccupation with collection, classification, and display ensued. By removing the natural object from its habitat, compromising its survival, and placing it in an incongruous but manageable and controllable interior space, the pathology of the fixation seems plainly revealed: obsession on a massive scale and an unwillingness, to paraphrase Edward Bulwer-Lytton, to “love the rose leave it on its stem,” belies a response to a shared anxiety which pervaded the culture at all levels. The natural objects used within this context, such as animals preserved via taxidermy, are thus in a sense metaphorical containers of the effects of catastrophic change upon the inner lives of people experiencing such change. A sense of distress regarding humans’ position in nature had in this way been fermenting long before publication of On the Origin of Species in 1859. The appearance of Paley’s Natural Theology confirms the presence of conflicted feelings, functioning as a kind of marker in that struggle’s timeline. Amid this pervasive distress, the visual culture showed evidence of a preoccupation with human and nonhuman animal conflation, long before Darwin. This evidence is important because, as industrialism and scientific discovery changed the nature of human-nonhuman animal relationships, the collapse of the cultural taboo regarding the loss of distinction between human and nonhuman animal had radically changed into a fusion of the two. Popular artists such as Edwin Landseer, a favorite of Queen Victoria, specialized in portraying a variety of domestic animals, particularly pet dogs, in anthropomorphized contexts—not by depicting them dressed in clothes or as bipeds engaged in human activities (though there are important exceptions with monkeys as subjects), but in emotional roles which both resonated with human moral ideals and in part fulfilled traditionally anthropomorphized notions about animal behavior derived from bestiaries. Landseer’s animal paintings foreshadow Darwin’s work on emotions in the sense that they encapsulated the prevailing cultural mood by showing in visual terms how animals experience emotion with differences in degree but not in kind, relative to human experience, which strongly resonated with viewers. Yet Landseer depicted nonhuman animals both as sentient beings and as stand-ins for humans. Further, live monkeys brought from foreign travels were often seen in England around this pre-Darwinian time at fairs and in other display settings (Ormond 1981, 39), frequently dressed in clothing or supplied with teacups and other human trappings (see fig. 1), and monkeys’ striking physical resemblance to humans coupled with prevailing concerns regarding the changing human connection to nature and animal life gave rise to such imagery as The Monkey Who Had Seen the World (see fig. 2), as well as Edwin Landseer’s brother Thomas’ book of satirical engravings, Monkeyana, or Men in Miniature of 1827, which depict monkeys dressed as people engaged in a variety of situations exemplifying human weakness: reckless flirtation, drunkenness, artistic pretension, dandyism (see fig. 3), and the like. As a consequence of the pervasive “fragmentation of both society and thought” (Houghton 1957, 77) following industrialization, pet animals began to fill roles of emotional connection, as exemplified by such works as the Landseer canvas Attachment of 1829. Reproduced as an engraving and popularly circulated, it was inspired by Sir Walter Scott’s poem commemorating the death of a young man who died in 1805 while hiking in the Lake District and whose body was not discovered for weeks afterward, but whose faithful dog had never left his side. 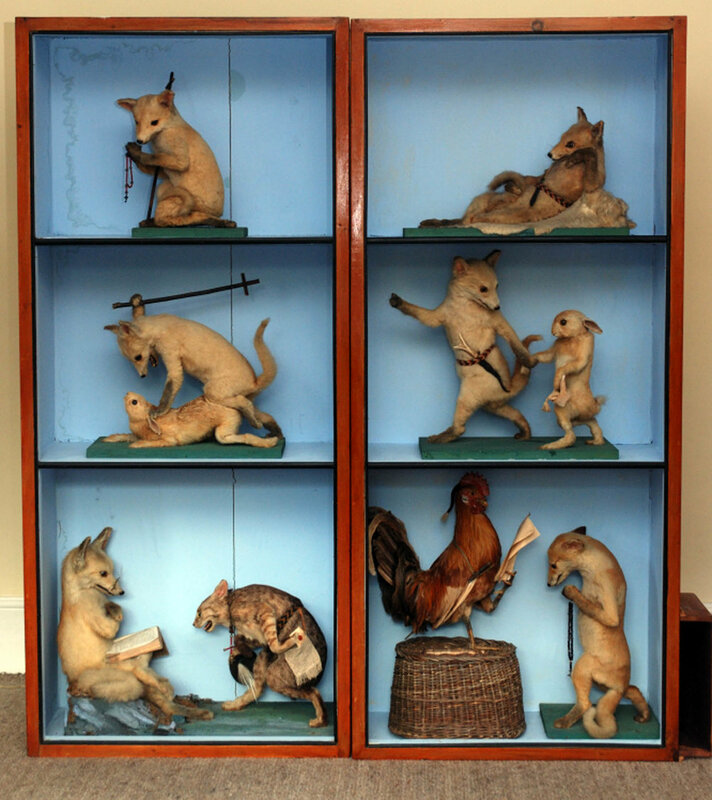 Less sentimentally, Charles Waterton’s satiric taxidermic assemblages, most notably The Nondescript of 1825 (see fig. 4), were prescient in their thematic focus on such human and nonhuman animal conflation and as such augured Darwin, in addition to functioning as social commentary on other concerns of the day, such as the marginalization of the Catholic minority and Linnaean classification. In 1851, Ploucquet’s taxidermic works using the mounted skins of animals posed to depict engagement in quotidian human activities, most eloquently and with the widest popularity made the visual case for the closest possible suggestion of the fusing of human and nonhuman animal. Hermann Ploucquet (see fig. 6), a naturalist from Württemberg, was staff taxidermist of the royal Stuttgart natural history cabinet at the time of the first display of his work in England. A German cultural and social milieu, like England’s battered by industrialism and social tension, and in significant ways evincing a preoccupation with medievalism, gave rise to artifacts such as Ploucquet’s and hence found strong resonance among the English, where taxidermy, both decorative and scientific, was very well developed and widespread. Walter Potter’s work has become more recognizable than Ploucquet’s; Potter operated a popular museum of his own works from 1861, in business until 2003. Hence Potter’s tableaux—Kittens’ Wedding (see fig. 5), for example—are more readily identified as “icons of Victorian whimsy” (5) per Pat Morris (2010) than are Ploucquet’s. Potter, however, was a but a youth in West Sussex at the time of the Great Exhibition. Ploucquet’s groups of anthropomorphized creatures, notably his series of six tableaux depicting Reynard the Fox (see fig. 7), when shown at the Great Exhibition in 1851, inspired the English branch of anthropomorphic and novelty taxidermy over the next several decades, with Walter Potter (1835-1918) to become its main exponent. Though it is possible that Potter independently conceived of an anthropomorphic approach, it is more likely that he was inspired by the news of Ploucquet’s sensational work, which could have reached him reached him via visitors traveling to and from London, resting at his family’s inn along the route; or he might have visited the Great Exhibition himself, perhaps on a “shilling day” when the entry fee was reduced. There is no evidence either way, but Potter was a proud and somewhat defensive craftsman, and he is not likely to have admitted that the idea was derivative. Taxidermy’s presence at the Great Exhibition (Class XXIX, Miscellaneous Manufactures and Small Wares) was appropriate as it was a product contingent upon science and technology, if not as a flourishing industry in itself. It represented a deviation from the new industrial model touted by the Great Exhibition, as one of the few kinds of products displayed which were handmade by skilled individuals. The appearance of anthropomorphic works (Ploucquet’s submission included these as well as more conventional mounts) was an unexpected surprise which resonated with a huge audience, though they subverted scientific interests by undermining the notion that preserved specimens were necessary only for taxonomic study. The work’s emotional power in the context of this international industrial fair gave expression to the complex state of affairs regarding the critically changing character of the human relationship to nature in the wake of industrialism. Where Ploucquet’s anthropomorphic work was concerned, commentators’ remarks went from arid to effusive, centering on the emotional impact of the work and its narrative content. Forgoing science momentarily, an Athenaeum reviewer reflects wistfully, “Nothing could be happier than the whimsical air of gentility and sentimentality which the artist [Ploucquet] has succeeded in throwing into the attitudes of these creatures” (1851). The Ploucquet entry, number 107 in the Württemberg section of the Great Exhibition Official Descriptive and Illustrated Catalog (1851), stands out for its length alone among the 110 two-or-three-line entries, bracketed on page 1120 as several paragraphs following the summary of the pieces on display, confirming its popularity and resonance among the Exhibition visitors: “Among those groups of animals are several in imitation of the attitudes, habits, and occupations of rational creatures. The precise expression of intelligence given to these animals has formed one of the many attractions of the Exhibition.” A précis of the Reynard the Fox tale excitedly follows. The fervor generated by these “wonderful and mirth-exciting groups of stuffed animals” (Catalog 1851, 1114), this “most popular group of objects in the Glass Palace” (Athenaeum 1851) weakened the ostensible scientific purpose of this class of objects; yet the London Critic of 1852 makes the case that without scientific study, Ploucquet would not “have been able to model those charming groups which afforded entertainment to thousands, and have even set a fashion for the season!” (45-6). Thus the value of the Ploucquet anthropomorphic groups represented something beyond any purported purpose associated with the Exhibition; reaction was unexpected and irrepressible, leading commentators to find justifications for its success in spite of official policy. Here the anonymous author makes the familiar assertion that anthropomorphism is a “tendency of the German mind to construct legends of which the lower animals are the personages and dramatis personae,” reflecting a need to distance it from Englishness. Further, the author takes another opportunity of framing his praise with an affirmation of British superiority by asserting that “we do not coincide” with the “extravagant degree” of admiration for the German folkloric subject of Ploucquet’s Reynard the Fox tableaux: “Jack the Giant-Killer or Puss in Boots [anthropomorphism notwithstanding] is worth a dozen of it,” (6) and even going so far as to suggest that Goethe had stooped very low to engage Reynard as poetic theme. The site of this and other pieces by Ploucquet, the article affirms, is one of the busiest and most crowded of the Exhibition, eliciting hearty laughter and keeping guards busy with crowd control. This August 1851 article also announces the availability for purchase (at Bogue, 86 Fleet Street, London) of the book of Ploucquet’s exhibits, The Comical Creatures from Wurtemberg, illustrated with wood engravings made from daguerreotypes 4 of the taxidermy mounts. The Exhibition opened only in May of that year and closed in October, so the work of daguerreotyping and engraving, not to speak of creating the accompanying text and printing the book, must have been a plan hatched with urgency, to exploit the unexpected and dazzling success of the original work. Other critical voices include Montagu Browne, author and preparator for the Leicester Museum; Browne termed the anthropomorphic treatment of specimens “the grotesque school,” in his Practical Taxidermy of 1879. Browne observed that Ploucquet gave animals “that serio-comic and half-human expression which was so intensely ridiculous and yet so admirable.” To be sure, Browne commends Ploucquet for his advances in showing powerful human emotions—“hope, fear, love, and rage”—in his taxidermied animals, comparing this expressiveness to typically stiff, emotionally flat taxidermic treatment, yet in so mentioning, unconscious of his own conflation of the experiential in human and nonhuman animal. Browne found that Ploucquet’s “half-human” approach “misrepresents nature in the most natural way possible,” as he characterized the anthropomorphic, or “grotesque” school (12). That Ploucquet’s work was originally framed within the context of the Great Exhibition gave it exposure to precisely the audience who would be eager for its spirit: it provoked intense emotional response associated with broadly changing cultural currents of the era, reverberating for decades to come and becoming firmly identified with the era. Ploucquet’s works, though not necessarily the original exhibits from the Great Exhibition, were displayed continuously at the relocated Crystal Palace until the Sydenham fire (see below). As late as 1873, the Illustrated London News announced that “A very interesting collection of nearly four hundred groups of modeled and stuffed animals by the celebrated taxidermist, Herr Ploucquet of Stutgardt, is on view at the Crystal Palace [Sydenham], in the gallery above the Egyptian Court” (619). The high number of pieces may refer to a large shipment made by Ploucquet in 1868. The Illustrated London News notice, published twenty-two years subsequent to the Great Exhibition, was still newsworthy. Hermann Ploucquet was born in the kingdom of Württemberg, in what is now southwest Germany. 5 His ancestors were Huguenots from Lyon who emigrated in 1685, settling in Stuttgart, Württemberg’s main city, in 1700; the family records left behind in Lyon which recorded their history prior to their departure were burned by the French. Among Hermann’s ancestors was a Gottfried Ploucquet (born 1716), who became a professor of logic and metaphysics at Tübingen. Gottfried’s son, Wilhem, was in turn a doctor and professor at Tübingen, and at one time a university building was named for him. Goethe mentions in his diary on 8 Sept 1797 that he met with this Ploucquet and enjoyed a “very pleasant prospect” (qtd. in Dolmetsch 1930, 96) from his garden. In the next generation, a Christoph Friedrich Ploucquet, founded a textile company in 1806 which is still in business today. The Ploucquet families subsequently resided in an area of Stuttgart known as “Dyer Road,” where textile workers lived, and Hermann was born there in April, 1816. His father Karl was a dyer; his mother was a daughter of the Württemberg agricultural inspector. Dolmetsch’s account simply interjects here, “They lived in miserable conditions.” The family was taken in by an uncle, Gottlieb Christian Eberhard von Etzel, an eminent town planner in Stuttgart, who showed particular concern for Hermann, the youngest of the family, described by Dolmetsch as bright, lively, with an artistic sensibility and an open mind. In the woods and on the heath, Hermann evinced a talent for collecting flowers and herbs and for catching beetles and butterflies better than anyone else. He became skilled at catching birds and other small animals, keeping them in cages, until he killed and stuffed them, having taught himself taxidermy methods from a how-to book. Ploucquet was, like Walter Potter, self-taught in taxidermy. He made money by trapping and mounting small animals and selling them, later as well by taking commissions for taxidermying pets of his neighbors in Stuttgart. His technique was inventive, and he was able early on to devise ways of posing animals in positions of action, painstakingly perfecting his technique through trial and error. With his earnings he bought a shotgun to ensure a supply of animals to stuff and also supported his needy parents, particularly his mother, who suffered chronic illness. He hoped to become a painter or sculptor, and his uncle sponsored drawing lessons; however, it was decided that art was “the spice but not the bread” of life, so his uncle arranged for Hermann to become apprenticed to the court gardener. At age seventeen, however, he began work as an assistant stuffer in the royal natural-history cabinet, having completed the gardening apprenticeship—apparently he was able to apprise his employers of his remarkable sideline in taxidermy, and his value as a preparator was fortunately appreciated. Thus a picture is drawn of a motivated youth who likely was capable of advocating for his own interests and of working quite beyond what was merely expected of him. He soon took on extra work, taking commissions from hunters and finding buyers for colorful bird mounts; he was also able to rent a workshop of his own. Outside of his formal employment, Ploucquet additionally created comic mounts for private clients. Based upon the Bavarian folkloric creature, the wolpertinger (typically pictured as a horned rabbit), which was created by cobbling together a rabbit with other animal skins, Württemberg provided the cultural background for the precedence of a taxidermy which surpassed mere taxonomic purpose. It is likely that the extreme social tension and economic distress of the era contributed to Ploucquet’s impulse to externalize anxieties regarding the concept of place with its associated interpersonal connections by creating it symbolically in animal habitat groups. Further, Dolmetsch’s text suggests that Ploucquet’s interest in creating habitat groups of animal families (see below) merged with both the wolpertinger tradition and his warm relationship with his sister Pauline, with whom he had played as a child, dressing her dolls in clothes. The talented Pauline created the clothes for Hermann’s stuffed animals; the siblings thus collaborated and sustained each other’s efforts. This warm sibling relationship and intra-familial support is strikingly similar to Water Potter’s experience with his own sister, who sewed the clothes for Potter’s taxidermy creations. From 1847 to 1858, Ploucquet was the chief staff taxidermist (Präparator) for the royal natural history cabinet in Stuttgart (Allgemeine 1876-80, 63) and was encouraged to enter work in the annual Leipzig trade fair in 1850, though he was reluctant to participate, according to Dolmetsch. However, he entered several works, among them some of his initial comic pieces were shown (“comic” is a term observed to be synonymous with “anthropomorphic” in the literature on taxidermy)—he earned a medal and was acclaimed in the press as a brilliant newcomer. From the strength of that success, he entered several groups in the Great Exhibition in London the following year. Ploucquet had built a reputation for innovation in surpassing simple taxonomic displays and had, according to Dolmetsch (100-01), created scientific habitat groups of individual communities of animals, or what Lynn K. Nyhart (2009) refers to as “biological” groups, though this approach was not completely without precedent: Nyhart cites, for example, Württemberg Duke Karl Eugen in 1786 who had commissioned a number of specifically naturalistic groups, such as a fox stalking a quail in shrubbery (57). Aside from the anthropomorphic groups which he displayed at the Great Exhibition, Ploucquet’s additional entries were relatively sensational habitat groups of violent scenes of predators attacking prey, such as hounds viciously attacking a stag and another of hounds brutally bringing down a wild boar. The engravings of these pieces, which illustrate the Great Exhibition catalog (see fig. 8), are notable for their violent dynamism and brutal realism, depicting intense physical struggle in a natural setting. Such scenes of violent confrontation among animals had long-established precedence in painting and sculpture, but Ploucquet innovated in this regard in making the art-historical reference with taxidermied animals, not by reconfiguring a painting as sculpture with marble or other traditional materials. A reviewer in the Illustrated London News on 26 July 1851 began his assessment a bit skeptically and critically of these two groups, indeed citing Frans Snijders, the Flemish baroque animal painter, as the source for the pictorial arrangement of the boar group, but finding the violence repulsive declares these works to be “disgustingly painful” and “absolutely revolting” (134-35). Yet this comment comes from someone well acquainted with such depictions in the painting tradition; the mounts (the originals long lost) must therefore have been viscerally very effective. The reviewer however softens his tone incrementally, conceding that Ploucquet’s hawks are “well-stuffed” and “ingeniously” displayed. He describes a piece for which no illustration is extant, polecats attacking a hawk’s nest: “another piece of dramatic taxidermy.” Frolicking fox cubs form “another pleasing group.” Having noted that Ploucquet’s work is divided into two classes—“ordinarily preserved birds and beasts . . . only facsimiles of living nature”—and, the second, animals “endowed with a caricature of human intelligence, and represented in illustrations of legends and fables, as occupied with human pursuits and performing human actions,” the anonymous reviewer ascribes the anthropomorphism he observes in Ploucquet’s Reynard the Fox tableaux as something typical of Germans (Aesop et al. notwithstanding). “We recognize at once the practical exemplification of that old tendency in the Teutonic mind to gift brutes with human intelligence, and to make them take parts in long, exceedingly droll histories, just like men and women,” he observes, citing Bulwer-Lytton’s popular Pilgrims of the Rhine as evidence. To be sure, Bulwer-Lytton (1834) included a footnote in Chapter XII of Pilgrims, “The Wooing of Mr Fox,” in which he asserts that he will give “the English reader an idea of a species of novel not naturalized among us” in which “brutes are the only characters drawn . . . beings that belong to the German superstitions.” Clearly the author reflects an impulse to ascribe the trope of anthropomorphism, implicitly observed as primitive, to a culture other than his own, indeed suggesting an association with barbarism, as he concedes that though animal tales are unfamiliar to the English, they are found among the Irish (118). This unease, along with the delight noted elsewhere, as mentioned, points to dual strains of affective aesthetic response and reflects the struggle regarding collapsing traditional notions of distinctions between human and nonhuman animal. Though Ploucquet clearly modeled Reynard the Fox upon Wilhelm von Kaulbach’s illustrations to an 1846 edition of the tale by Goethe, the tale itself had a long if sporadic history of publication in England, first by William Caxton in 1479 and later, in 1844 by Felix Summerly (the pseudonym of Henry Cole). The above-noted Illustrated London News reviewer continues, “In all these clever specimens of eccentric art taxidermy, the natural cunning and intelligence of the fox’s face is exaggerated with very great skill while the natural simplicity and stupidity of the hare’s countenance is just as forcibly worked out . . . the animals are endowed with the strangest human expression, and yet they are animals still.” He cites Ploucquet’s “curious degree of skill and drollery” found in others of his anthropomorphic groups, such as weasels hunting hares (see fig. 9), rabbits “trying in vain to do sums on slates” (presaging Walter Potter’s similar work) (see fig. 10 and fig. 11), frogs “walking genteely out with umbrellas” (see fig. 12), and singing cats (actually stoats) (see fig. 13 and fig. 14). For some of these groups, illustrations are extant, having been reproduced in both the Illustrated London News and in the aforementioned Comical Creatures From Wurtemberg. What the context of the narratives created for Comical Creatures obscures, though plain in the “biological” mounts depicting animals viciously attacking one another, is that upon a deeper look, one notices the recurring theme of violent confrontation, which is seen in Reynard the Fox and the mounts featured in Comical Creatures: Reynard is shown deceiving and beating the gullible rabbit; stoats calmly butcher a captive and helpless group of hares; a schoolmaster “teaches arithmetic” by brutally beating a small, helpless pupil with a cane, while his classmates, paralyzed with fear do not dare look up from their slates; a dentist with a sadistic half-grin, half-grimace yanks with enough force on a vulnerable patient’s tooth to send the patient flying out of his chair; a frog shaving another frog holds a razor to his innocently exposed and vulnerable throat while the positioning of the forearm of the seated frog suggests an imminent defensive struggle, belying the purported caption and speaking more to a sense of anxiety or menace. In fact, a visitor to the private museum in Stuttgart which Ploucquet founded after leaving the royal cabinet in 1858, and which had become well-known and had profited from the success of the Great Exhibition, commented that the groups on display were “murder scenes which were caricatures of human behavior enacted by pets . . . every creature here, it is understood, seems more or less to be simultaneously in a continual struggle to the point of destruction.” According to both Dolmetsch and Köstering, Ploucquet was influenced by the animal shows and zoos of the 1850s and 1860s, first convening his private museum in the garden room of his house and later at a local spa. To be sure, his animal groups included, according to the report of this visitor, “two anteaters, one entwined by a serpent; four tigers at a dead flamingo; a group of eagles with a fallen antelope in a snow landscape; three lions with a zebra; a wolf with its young about a fawn; two lynxes with a fallow deer, one zebra set upon by four Egyptian vultures” (Kurt Büchele , qtd. in Köstering 2003, 153). Analysis of the anxiety and violence observed across all modes of Ploucquet’s work, even that obscured by comicality, leads one to question if the work is an indicator of pathology, an attempt to resolve it, or both. "Visitors to my museum are largely composed of strangers from far distant places, of sculptors and animal painters, who travel to Stuttgart specifically for the sake of my collection and of late spend weeks making studies of my animals. . . I undoubtedly owe the abundance of foreign visitors to Baedeker’s travel guide, which lists my institution as a famous European attraction. . . I plan namely to use the now abundant material from my museum to create a conservatory in such a way that each group forms a self-contained series with the landscape background appropriate to the animals . . . I am going to use a number of my finest animal tableaux to produce a small-scale version of such a garden in Vienna; my works will enjoy quite different recognition in Vienna as was here the case, particularly since the Emperor is extremely interested in my museum. (“Hochverehrter Herr Direktor!”)"
The 1868 shipment likely included Skating Hedgehogs (see fig. 16) and The Village Dentist (see fig. 17), which, according to the Strand Magazine (Fitzgerald, 1897) were among works shown at the Victorian Era Exhibition held at the Sydenham Crystal Palace in 1897, one of a series of specially themed exhibitions which took place between 1895-1906. As for the disposition of his Great Exhibition anthropomorphic works, they may have been sold piecemeal (see below), or they may have been purchased en masse and also installed in the Sydenham Crystal Palace; in the latter case, they would have been destroyed in the fire there of 1936. Pat Morris believes that most of the works displayed at both locations are simply missing. 6 Morris himself owns the Reynard tableaux, having located them by chance at a Norfolk antique shop in 1985. Morris also reports that the two of Ploucquet’s Great Exhibition pieces which had been borrowed by the Victoria and Albert Museum in 1951 for a Great Exhibition centenary show, from Lord Leigh, Stoneleigh Abbey, Warwickshire, were subsequently sold at auction in 1981 and that the auction catalog had incorrectly attributed the work to Walter Potter (2010, 128). Regarding the likelihood of the sale of his Great Exhibition works, a letter written by Ploucquet to an unknown recipient (it is addressed to “Most Esteemed Sir”) (see fig. 18) dated 31 May 1851, along with the later letter cited above archived at the Landesarchiv Baden-Württemberg, reveals that Ploucquet himself was in London to attend the Great Exhibition: he writes, “I take the liberty of expressing my belated but sincerest thanks for the courtesies shown me during my stay in London,” and he exhorts the addressee to “contribute to speedier sales” of the exhibited works through advertising and the urgent distribution of catalogs to “rich hunting enthusiasts” (“Hochgeehrtester Herr!”), hoping to catch them before they leave London for the summer season in June. The breathless tone of this letter reveals a sense of the unexpected sensation generated by this exhibition and his ambitious seizing of the opportunity to capitalize upon it. 7 Therefore this letter supports Pat Morris’ supposition that Ploucquet’s Great Exhibition works were sold to individuals, not transferred to the Sydenham Crystal Palace. How did the German popular relationship with the natural environment compare with that of Britain? A preoccupation with natural history was observed across all social classes, as in England, but the dynamic regarding the diffusion of information about shifts in that preoccupation seems to have been different. First, as Lynn K. Nyhart (2009) explains, the “biological perspective,” or what we might think of as an ecological point of view, one in which strictly rote taxonomic classification was replaced by a view which placed emphasis upon dynamic inter-relations between organisms and their natural habitat. Nyhart asserts that taxidermists such as Ploucquet, rather than academics, were at the forefront of promoting this view of things, by creating taxidermy tableaux which entailed entire animal families in their natural habitats, or indeed, habitat settings which featured prey and predator. Ploucquet’s successor at the royal natural-history cabinet, Philipp Leopold Martin, wrote and published opinions about these views in his Praxis of Natural History of 1869; he was “dismayed by the reduction of a living animal, an individual with a life, to a scientific specimen intended only to illustrate a taxonomic diagnosis” (Nyhart 2009, 51). Aside from Nyhart, who asserts that the rapidly changing social order in Germany, as in England, provided the context for the biologically, environmentally organized taxidermy groups which showed how each being fit naturally within its environment, Susanne Köstering has also reached similar conclusions and interpretations regarding the development and influence of the biological approach in museum taxidermy displays. 8 Indeed, as we have seen with Ploucquet’s work, the habitat settings of various groups of animals served as metaphors, providing an opportunity to emotionally displace intense, conflicted feelings of identity confusion and other sorts of social and interpersonal anxiety. In the later part of the century, Friedrich Junge, a pedagogue, advocated the study of biological communities for children (this system came to be known as the “Village Pond”) to stimulate their own existential thought about where they belong in society (Nyhart 2009, 13). The metaphor seems especially but darkly fitting, taken to pathological extreme in the struggle over the splintered German identity of the 1930s. Further, trends and shifts in the popular relationship to natural history flowed up, rather than trickle down (Nyhart 2009, 18); for example, advances by taxidermists such as the self-taught Ploucquet who was not a scientist but who created innovations such as habitat tableaux, drifted upward to academics. Nyhart points out that such an outcome, of scientific approaches emerging from popular impulses and eventually earning approval of the scientific establishment, is very unusual. Considering the socio-economic milieu from which Ploucquet emerged, the power of his drive, ambition, talent, self-taught skill in a technical area, and rise from youngest child of an impoverished family to innovative staff of royalty and successful museum founder is remarkable. As with Walter Potter, warm intra-familial relationships, especially that with his sister, substantively affected the progress and outcome of his work. Yet even his ostensibly “comic” anthropomorphic works, which resonated most strongly with the British audience of 1851 and beyond, consistently evinced violent confrontation, obscured as it is by juvenility and the mundus inversus comicality of animals behaving as humans, hinting at darker, more anxious drives for the creation of the work. Ploucquet’s success in England enabled him to establish his own museum on the continent and continue to sell to English clients. Though his work is relatively little documented, there is more reference material in English about him than in German. Both Ploucquet’s work, exhibited continuously until 1936 in London in the Sydenham Crystal Palace, and ending only with the fire that destroyed the entire building, and that of Ploucquet’s British counterpart, Walter Potter, had consistent if modest staying power, continuing to strike a nerve, a note of resonance, attracting steady audiences through 2003, the date of the auction sale of the Potter Museum contents. Distinctive to and sensational in its time, later eras eschewed Victorian anthropomorphic taxidermy; to be sure, scholarship on the subject is almost non-existent, and museums have declined to acquire any pieces for their permanent collections. Potter’s museum was a decidedly marginal institution, though its compelling visual power nevertheless kept it running, if modestly, until 2003. Contemporary viewers of Victorian anthropomorphic works hence struggle to determine if what they are looking at is iconic or merely eccentric. All works of taxidermy, but especially anthropomorphic figures, evoke dual emotions of discomfort and fascination, an aesthetic experience akin to what Edmund Burke and others described as the aesthetic sublime, a sensation we recognize as emotional ambivalence—a struggle between delight and terror. Further, the discomfort of viewing taxidermy of any kind for the twenty-first-century audience is palpable: animal rights, environmental issues, taste, natural history, science—all of these issues frame and influence how we perceive the taxidermied object. In this paper, I have shown how a variety of social forces converged to create the conditions for the flourishing of the practice of taxidermy and the development of its anthropomorphic school. Victorians produced and found resonance with such work because it reflected a collective emotional condition which resulted from an era of a cascade of cultural shocks subsequent to and including the Industrial Revolution: beginning in the early nineteenth century, taxidermy emerged in part as an expression of the extreme tension between natural history and theology, a reaction to the supplanting of religion by science and the upsetting of traditional cosmological perspectives. Further, developments in land management, enclosure in particular, forced a rapid and destabilizing change in the relationship between humans and animals. In turn, social change generated mass anxiety and confusion of identity, in the process agitating pre-Reformation ghosts, as the popularity of morbid images of ruined abbeys indicate. On the same aesthetic continuum, Gothic Revival emerged as the dominant style in civic architecture. In a sense the Gothic sensibility expressed in anthropomorphic works of taxidermy represents the return of dissociated parts of a common history: vanished traditions of rural life, a fractured relationship to labor, a fraught connection to state religion, and the confusion of an altered relationship with nonhuman animals. In the decades preceding Darwin’s On the Origin of Species, Victorian visual culture was full of evidence of rich man-monkey conflation, of nonhuman animals standing in for people, as paintings, engravings, and works of anthropomorphic taxidermy show. These taxidermic objects defy classification in terms of traditional art historical values, but as artifacts of visual culture, as metaphorical containers of historical information, we can plumb them for insight into what they say about the anxieties, obsessions, collective psyche, and emotional heart of the culture which produced them. There are abundant connections to be made from this study; for example, the rise of the human capacity for empathy was concurrent with the incidence of depiction of the merging of human and nonhuman animal sentience in visual art (as in Landseer) and in literature (such as Dorothy Kilner’s 1783 Life and Perambulations of a Mouse, a first-person narrative which anticipates later Victorian animal autobiography), but that merging also reflected a loss of identity as a result of industrialism having so radically changed human and nonhuman animal inter-relationships. As Andrew Brink (2000) has asserted in his studies on the psychic process of creativity, “Creativity in the arts is an emergency response to anxiety.” He has admonished that, when evaluating a work of literary or visual art, it is often necessary to “look deeper” (189) beyond the surface appearance—in this case beyond the ostensibly eccentric—and probe the question-raising elements—biographical, iconographic, and historical—to reveal the anxious origins of the creation of the object, the process by which inner experience is formally and externally reorganized. Decoding reveals that anthropomorphic taxidermic works, indeed as well as many other forms of contemporaneous visual art, correspondingly emblematize the collective response to shared traumas of the era. As Brink notes, “Creativity is enormously valuable as an indicator of thematic anxieties, showing in the arts the human wish for wholeness being cramped, warped, or dangerously depersonalized;” yet he also observes that “the arts are often indicators of social pathology and wishes for healing” (1992, 180), evoking the very grotesquerie of the anthropomorphic taxidermy which flourished in the last half of the nineteenth century. 1 Two scholars, Conor Creaney and Michelle Henning, have recently touched upon some of the issues I raise in this paper, though with different approaches and conclusions. Creaney published a piece on Walter Potter, derived from a chapter of his dissertation, in the Autumn 2010 edition of Victorian Studies; Henning, a lecturer at the University of the West of England, Bristol, in a 2007 piece in Victorian Literature and Culture briefly outlined the work of the three main exponents of anthropomorphic taxidermy: Potter, Ploucquet, and Waterton. 2 Of the leading Victorian taxidermists, only Charles Waterton pioneered in environmental and wildlife conservation. 3 The Zollverein was a union of several German states which included Württemberg. 4 The daguerreotypes were made by Antoine Claudet (1797-1867), a Frenchman from Lyon who was active in London as a businessman. He had bought a license to use the process from Daguerre in 1841 and set up shop in London to become one of its first daguerreotypists. The daguerreotypes made of Ploucquet’s work at the Great Exhibition are unfortunately lost. 5 Biographical information is from Bilder aus Alt-Stuttgart: Nach Erzähltes und Selbsterlebtes (Pictures of Old Stuttgart: Heard and Experienced) by Eugen Dolmetsch, 94-112, unless otherwise noted. All translations, unless otherwise noted, are mine. 6 See Morris, History 123-30, for a detailed discussion of the subject. 7 The Ploucquet letters (a second letter is dated 26 August 1863), written in an archaic and idiosyncratic script, and heretofore not translated into English, were translated in March 2012 by Irma Lang and Frances Zichanowicz, both of Waldshut, Germany. 8 See Köstering’s Natur zum Anschauen: das Naturkundemuseum des deutschen Kaiserreichs, 1871-1914 (Nature for Observation: The Natural History Museums of the German Empire, 1871-1914), for a discussion on the subject. Fig. 1. Jenny the orangutan as she appeared in the Penny Magazine for the Diffusion of Useful Knowledge in 1837. Jenny was displayed at the Regents Park Zoo in London and was visited by Charles Darwin in 1838. As Harriet Ritvo has noted, such captive-animal displays both “confirmed and parodied” the close connection between humans and other primates (291). Fig. 2. The Monkey Who Had Seen the World (1827), Edwin Landseer. Oil on panel, 47 x 54.6 cm. Guildhall Art Gallery, London. Fig. 3. “Monkey Dandy,” from Monkeyana, or Men in Miniature, designed and etched by Thomas Landseer (London: Moon, Boys and Graves, 1827). “Fools ne'er had less grace in a year!/For wise men are grown foppish/And know not how their wits to wear/Their manners are so Apeish”—King Lear, William Shakespeare. Etching on chine collé. Plate: 7 7/8 x 6 7/16 in. (20 x 16.3 cm); Sheet: 13 5/16 x 9 1/2 in. (33.8 x 24.2 cm). The Elisha Whittelsey Collection, The Elisha Whittelsey Fund, 1959. Accession no. 59.600.38(5.4). The Metropolitan Museum of Art, New York. Fig. 4. “A Nondescript.” Frontispiece to Charles Waterton’s Wanderings in South America, 1825. Drawing by J.H. Foljambe; engraved by J.W. Lowry. Fig. 6. Hermann Ploucquet pictured in Bilder aus Alt-Stuttgart: Nach Erzähltes und Selbsterlebtes (Pictures of Old Stuttgart: Heard and Experienced) by Eugen Dolmetsch (Stuttgart: Steinkopf, 1930). Fig. 7. Reineke Fuchs (Reynard the Fox) (ca. 1850), Hermann Ploucquet. Taxidermy and mixed media. Private collection. Photo courtesy of Pat Morris. Fig. 8. Illustrations of two of Ploucquet’s groups shown at the Great Exhibition. From The Great Exhibition of the Works of Industry of All Nations, 1851: Official Descriptive and Illustrated Catalog. London: Royal Commission, 1851. Fig. 9. The Wonderful Hare-Hunt. Frontispiece from The Comical Creatures From Wurtemberg (London: Bogue, 1851). Wood-engraving of Hermann Ploucquet’s taxidermy tableau from a daguerreotype by Antoine Claudet (French, active in London), who had bought a license from Daguerre in 1841 to practice the art. Fig. 10. Longtail Teaching the Young Rabbits Arithmetic (ca 1850), Hermann Ploucquet. Taxidermy and mixed media. Rabbits do sums on slates rather fearfully, at right. As shown in the Great Exhibition, 1851. Photograph from the Victoria and Albert Museum image collection; the actual work is lost. The Victoria and Albert Museum mis-identifies the piece as an 1888 English work (the photo was likely acquired in that year); no artist name is given; however, the photo exactly matches one of the Comical Creatures illustrations. Photograph from collection of V & A Images (Image No. 1000BW0093-01). See also fig. 11. Fig. 11. Longtail Teaching the Young Rabbits Arithmetic. From The Comical Creatures From Wurtemberg (London: Bogue, 1851). Wood-engraving of Hermann Ploucquet’s taxidermy tableau from a daguerreotype by Antoine Claudet. See also fig. 10. Fig. 12. Shaving: A Luxury. From The Comical Creatures From Wurtemberg (London: Bogue, 1851). Wood-engraving of Hermann Ploucquet’s taxidermy tableau from a daguerreotype by Antoine Claudet. The piece was re-titled for the book. There is no extant photograph of the actual work. Fig. 13. The Kittens at Tea—Miss Paulina Singing (ca 1850), Hermann Ploucquet. Taxidermy and mixed media. “Miss Paulina” may be a reference to Herman Ploucquet’s sister, Pauline, who collaborated with him by sewing clothes and accessories for the stuffed animals. As shown in the Great Exhibition, 1851. Photograph from the Victoria and Albert Museum image collection; the actual work is lost. The Victoria and Albert Museum mis-identifies the piece as a nineteenth- or twentieth-century English work, whose title is Mrs. Partington’s Tea Party. No artist name is given; however, the photo exactly matches one of the Comical Creatures illustrations. Photograph from collection of V & A Images (Image No. 1000BW0134-01). See also fig. 14. Fig. 14. The Kittens at Tea—Miss Paulina Singing. From The Comical Creatures From Wurtemberg (London: Bogue, 1851). Wood-engraving of Hermann Ploucquet’s taxidermy tableau from a daguerreotype by Antoine Claudet. See also fig.13. Fig. 15. Hermann Ploucquet letter, original, page 1 of 3. “Hochverehrter Herr Direktor!” [“To ‘Most Honoured Director!’”]. 26 August 1863. MS. Signatur: PL 702 Bü 851. Landesarchiv Baden-Württemberg. Fig. 16. Skating Hedgehogs (ca. 1860), Hermann Ploucquet. Taxidermy and mixed media. As pictured in the Strand Magazine, 1897. Original work lost or destroyed in 1936 Sydenham Crystal Palace fire. Exhibited at the Victorian Era exhibition held there in 1897, one of a series of themed exhibitions held from 1895-1906. Fig. 18. Hermann Ploucquet letter, original, page 1 of 2. “Hochgeehrtester Herr!” [“To ‘Most Esteemed Sir’”]. 31 May 1851. MS. Signatur: PL 702 Bü 851. Landesarchiv Baden-Württemberg. Allgemeine Deutsche Ornithologische Gesellschaft. Ornithologisches Centralblatt: Organ für Wissenschaft und Verkehr. 1876-80. (General German Ornithological Society. Central Ornithological Journal: Organ for Science and General Circulation) Leipzig: Kittler. Brink, Andrew. 2000. The Creative Matrix: Anxiety and the Origin of Creativity. New York: Peter Lang. ---. 1992. Creativity as Repair: Bipolarity and Its Closure. Hamilton, Ontario: Cromlech. Browne, Montagu. 1879. Practical Taxidermy: A Manual of Instruction to the Amateur in Collecting, Preserving, and Setting Up Natural History Specimens of All Kinds. London: Bazaar. Buckland, Adelene. 2007. “The Poetry of Science: Charles Dickens, Geology, and Visual and Material Culture in Victorian London.” Victorian Literature and Culture: 35: 679–94. Bulwer-Lytton, Edward. 1834. The Pilgrims of the Rhine. London: Saunders and Otley. Chambers, Robert. 1844. Vestiges of the Natural History of Creation. London: John Churchill. Clark, Kenneth. 1962. The Gothic Revival: An Essay in the History of Taste. London: Murray. [London: Constable and Co., Ltd., 1928]. “The Comical Creatures from Wurtemburg.” 1851. Morning Chronicle, London. Issue 26415. 12 August. Dolmetsch, Eugen. 1930. Bilder aus Alt-Stuttgart: Nach Erzähltes und Selbsterlebtes (Pictures of Old Stuttgart: Heard and Experienced). Stuttgart: Steinkopf. “Fine Arts.” 1873. Illustrated London News, London. Issue 1792. 27 December. Fitzgerald, William G. 1897. “Side-Shows.” Strand Magazine 13: 523-24. Gates, Barbara T. 2007. “Introduction: Why Victorian Natural History?” Victorian Literature and Culture 35: 539-49. Gibbs-Smith, C.H. 1981. The Great Exhibition of 1851. London: Victoria and Albert Museum and Her Majesty’s Stationery Office. “The Great Exhibition.” 1851. The Morning Chronicle, London. Issue 26431. 1 September. Great Exhibition of the Works of Industry of All Nations, 1851: Official Descriptive and Illustrated Catalog. 1851. London: Royal Commission. Harman, P. M. 2009. The Culture of Nature in Britain, 1680-1860. New Haven: Yale University Press. Houghton, Walter E. 1957. The Victorian Frame of Mind, 1830-1870. New Haven: Yale University Press. Köstering, Susanne. 2003. Natur zum Anschauen: das Naturkundemuseum des deutschen Kaiserreichs, 1871-1914 (Nature for Observation: The Natural History Museums of the German Empire, 1871-1914). Köln: Böhlau. Merrill, Lynn L. 1989. The Romance of Victorian Natural History. New York: Oxford University Press. Morris, P.A. 2010. A History of Taxidermy: Art, Science and Bad Taste. Ascot: MPM. ---. Walter Potter and His Museum of Curious Taxidermy. 2008. Ascot: MPM. Morus, Iwan Rhys. 1993. “Currents from the Underworld: Electricity and the Technology of Display in Early Victorian England.” Isis 84: 50-69. “Natural History.” 1852. The Critic. Issue 259. 15 January. 45-6. “The Natural History of the Exhibition.” 1851. Illustrated London News. Issue 504 and 505. 26 July. Nyhart, Lynn K. 2009. Modern Nature: The Rise of the Biological Perspective in Germany. Chicago: University of Chicago Press. Ormond, Richard. 1981. Sir Edwin Landseer. Philadelphia: Philadelphia Museum of Art. Ploucquet, Hermann. 1851. “Hochgeehrtester Herr!” [“To ‘Most Esteemed Sir’”]. 31 May. MS. Signatur: PL 702 Bü 851. Landesarchiv Baden-Württemberg. ---. 1863. “Hochverehrter Herr Direktor!” [“To ‘Most Honoured Director!’”]. 26 August. MS. Signatur: PL 702 Bü 851. Landesarchiv Baden-Württemberg. Ritvo, Harriet. 2001. “The Natural World.” Victorian Vision: Inventing New Britain. Ed. John M. MacKenzie. London: V & A Publications. 281-95. Spacks, Patricia Meyer. 2011. On Re-reading. Cambridge: Harvard University Press. “Stuffed Animals in the Palace of Glass.” 1851. The Athenaeum, London. Issue 1234. 21 June. Topham, Jonathan. 1992. “Science and Popular Education in the 1830s: The Role of the ‘Bridgewater Treatises’.” The British Journal for the History of Science 24: 397-430. “Vilna, Poland, The partisan Rachel Rudinsky with a group of armed partisans during the liberation of the city, 1944.” Collection of Yad Vashem Photo Archive [Archival Signature 3271/13]. Abstract: Among millions of Holocaust documentary photos in a variety of archives over the world, only a few have been repeatedly published, transforming them “from mere photographic trace into icon." Why have images of Jewish resistance fighters never entered the visual discourse of the Holocaust at a comparable level? Abstract: Reflections on Andrew Brink's creativity studies, which urge a reappraisal of the field and offer a new paradigm for this subject by connecting relational anxiety with the creative drive. continuous link of a common aesthetic. Globally, the prime model of the architecture of mobility is the tent. where they have been inserted, creating a construction of tension. American Indians), Lapland, Siberia, as well as other locations. of the barter system, and sometimes aggression or invasion . . .
thought of in such architectural terms by their designers. as a contrasting concept to that of the fixed, unchangeable pyramid. notion of form whose posture confronts the grave, stacked-block tradition. "What's Missing From This Picture? 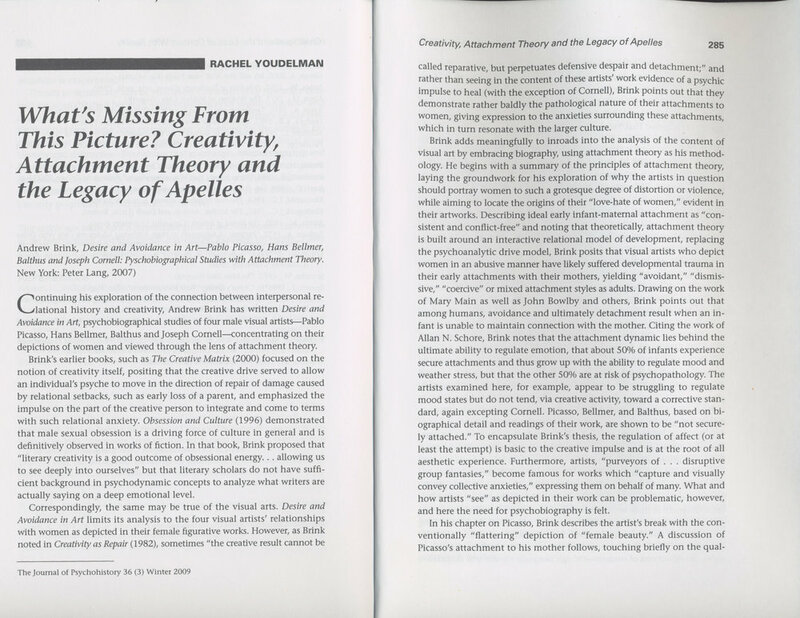 Creativity, Attachment Theory, and the Legacy of Apelles"